In those most desperate of weeks that crossed Christmas and the New Year I was getting daily updates on the Somali couple living rough outside TK Maxx on a busy south London street. A mother and son both with severe and enduring mental health problems, exhibiting delusional behaviour and severe self-neglect. They had been there for months, resisting all offers of accommodation or hospital treatment. Engagement with mental health specialists, our outreach workers, the police and members of the Somali community had all been in vain. Over the months their belongings blossomed around them. Carrier bags within carrier bags, suitcases, bedding, food cartons: the detritus of the destitute. Around the corner and out of sight of passers-by stood buckets in which they defecated. With Christmas approaching and the temperature falling the plight of the Somali couple became a shared obsession. Multi-agency case conferences took place to consider their mental capacity to make decisions and the last resort option of a compulsory admission to hospital using the Mental Health Act, was mooted. By now we were visiting daily, all of us dismally remembering a woman rough sleeper who, in similar fashion, resisted leaving the streets and was eventually found dead. It was a period of bitter weather; low temperatures and prolonged rain, the killer combination for rough sleepers, a time to increase the number of outreach shifts and when the vigilance of the public in spotting isolated rough sleepers and contacting us on their behalf is crucial. Around this time, a rough sleeping story broke. Outside a complex of up-market flats in south London the developers had set metal spikes into the concrete to prevent rough sleepers bedding down. On Twitter, outrage at this callous response to rough sleepers burst into life and fed stories that appeared in the national press. Further spikes were discovered outside Selfridges and other stores. Campaigners described the spikes as ‘an affront against humanity’. Petitions were signed and journalists put out the call to be informed if further spikes were spotted in order to ‘name and shame’. Bumping into a haggard outreach worker who had just completed an early morning shift, hands wrapped around a cup of tea, I was shaken by how inconsequential he regarded the spikes furore. ‘They’re appalled by spikes stopping people sleeping rough but indifferent to the people actually living on the street’, was his bitter assessment. Turning this comment over in my mind later, I began to see it from the perspective of an outreach worker, out in all weathers searching for rough sleepers, the most vulnerable of whom will be in hidden places. Around them swirls the humanity of the city with the vast majority of people apparently oblivious to their work, yet accustomed to the homeless figure lying in a doorway. The anaesthetic of familiarity is a most powerful drug. When yet another Tweet circulated, this one from a journalist I know well, a committed and compassionate person, requesting to be alerted to further sightings of spikes I responded by asking if she had ever rung the StreetLink number through which outreach teams can be notified about a rough sleeper who is of concern. She had the good grace to acknowledge that she never had. Next, a linked story emerged with a theme of how much better rough sleepers are treated in Vancouver, Canada. In Vancouver, to make it easier for people to sleep rough, an ingenious contraption has been designed which creates a temporary roof over a park bench. An article in the Daily Telegraph urged London to take inspiration from Vancouver. Far from being inspired, the roof-over-the-bench solution left me dispirited. We are adept at finding ways of mitigating the worst aspects of sleeping on the street. Over the years creative people have sent me intricate designs for pop-up tents and pod-like living capsules to make surviving on the street easier. Kind members of the public and corporate supporters regularly offer coats, sleeping bags, mittens and hand-warmers. But how can these be the solution? The brutal truth is that such responses which seek to help people live more comfortably on the street have cataclysmically failed. Vancouver offers clear evidence of this failure on a mega-scale. 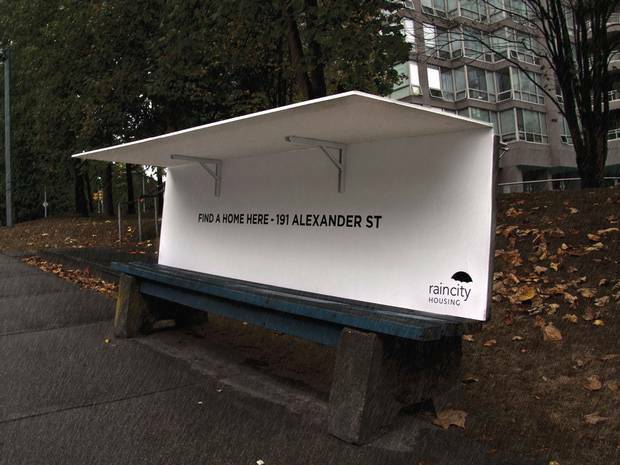 The 2014 Vancouver homeless count found 2,777 people sleeping rough or in shelters. Vancouver has a population a third of the size of London but with 957 rough sleepers on the street on any single night the city has 30% more rough sleepers than London. As spikes stories multiplied, in a parallel universe the determined partnership which refused to accept that the Somali couple should die on the street got a breakthrough when, in early January, they were admitted to hospital. Encouragingly, we were assisted by supportive individuals from the immediate neighbourhood and by a local journalist, all deeply moved by the couple’s plight and giving every impression that they regarded their unresolved, distressing predicament as - well - an affront against humanity. Sadly in April, having refused all offers of accommodation, they returned to the street, providing yet another reminder that ending rough sleeping would be considerably easier if all it involved was finding someone a home. The latest quarterly figures for London show that 44% of rough sleepers have mental health problems and we estimate that at least 600 people in poor mental health are, like the Somali couple, long term rough sleepers. These are people who commonly have disturbing life histories and often unfathomably obscure reasons for not accepting help to come off of the street. The challenges are enormous. Rough sleeping remains one of the great outrages of our time. Our failure is to enthusiastically focus on piece-meal responses, strong on ameliorating the immediate suffering of the poor and destitute, evidentially ineffectual in changing their situation permanently, for the better. We desperately need a programme to end the disgrace of people with severe and enduring mental health problems living and dying on our streets. It must be a properly resourced, multi-agency approach involving mental health professionals committed to working on the street to assess and support, outreach workers, the police and local authorities. I believe it is the kind of initiative that local communities and the wider public will back. It must be a programme within which roofs over benches do not figure. Thanks for your kind comment Martin and sorry to hear that you did not get the help you needed and deserved. I hope that life is treating you better now. I completely agree with you on this matter. I too myself, have read the numerous articles regarding the anti-homeless spikes outside Selfridges and other department stores and have been outraged at such actions. I admire the people that have gone out and signed petitions to end it, bringing the homeless blankets, working at soup kitchens to help them through this time. I know that you believe that it's not enough at the stage, and that what the homeless really do need is 4 walls around them, not just simply a blanket or a roof over the bus stop stations for them. But I do believe that baby steps is key, change will begin to start happening if we draw more awareness to the issue. Bringing blankets out to the homeless etc. is just the stepping stone of what is yet to come.